Hurley is currently ranked 19th on the Nationwide Tour money list. 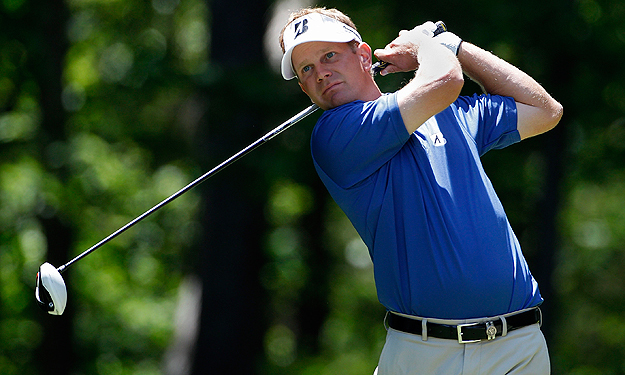 Billy Hurley doesn’t much care why he turned his season around only that he did. Now he is really looking forward to the next few weeks on the Nationwide Tour. Hurley, 29, is playing in his first full season on Tour and it was a harmless conversation he had with his swing coach in the middle of June that spurred him on. He was in the airport waiting to go to the Tour stop in Wichita when he called his swing coach, Mitchell Spearman. And Spearman had a little advice that Hurley took to heart. Hurley went on to finish fifth at the Preferred Health Systems Wichita Open and has made nine straight cuts. All of sudden he’s one of the most consistent players on Tour. He’s been so consistent of late he’s had 24 straight rounds of par or better. That’s why he’s in solid shape at No. 19 on the Nationwide Tour’s money list. Hurley has tried to analyze what Spearman said. It’s hard to believe that Hurley, a former officer in the Navy, was out of golf for basically five years as he fulfilled his obligation of military service. He was a star golfer at Navy, was on the 2005 Walker Cup team, but golf wasn’t a priority for the better part of four years. He was a lieutenant on a destroyer in 2010 in the Persian Gulf helping to protect the Iraqi oil platforms. He was very close to the war that’s been going on, and says its an experience he won’t soon forget. Hurley took special pride in the Sept. 11 recognition that was spread out all through the United States earlier this month for the 10-year anniversary of the terrorists attack. Hurley spent long stretches on various ships throughout his service time in the Navy, including a long stretch in Hawaii. But once he dove into his service he was on a ship for long stretches that didn’t give him many chances to keep his game sharp. His longest stretch without golf was from June 2007 until 2009. Of course there were a few times he and others would hit a few balls off the deck of the ship, which Hurley said was fun to do. “It wasn’t really a thing we did a lot but more just sometimes on a Sunday for fun we’d have a picnic on the flight deck and we’d have a golf mat and a couple of golf balls and we’d slap some balls out there into the ocean,” Hurley said. When his military obligations were completed Hurley worked hard to get his game back into shape and all of that work is paying off this year. He says that his life experiences and his military background have helped him. What has also helped Hurley’s game is his driving accuracy. He ranks 11th in that category on Tour and his scoring average is 16th-best on Tour. Hurley’s background might differ than most professional golfers, but his drive to succeed is very real. Hurley and his wife, Heather, have two children, 4 -year old Jeremiah and adopted son, Jacob, who is 2and was adopted two years ago from Ethiopia. As the Nationwide Tour winds down Hurley is optimistic about staying inside the top 25 that would earn him a PGA TOUR card in 2012. Hurley knew that his first season on the Nationwide Tour would be an eye-opener. Especially when it comes to how competitive and how much talent is out there. One of the perks that Hurley would love if he earns his PGA TOUR card for next season would be a trip to Hawaii in January.